Yep it’s officially that time of year when, at the peak of the cold weather, we’d rather do almost anything than have to get out of bed in the morning. So, when we can, let’s pull up our quilts and snuggle down. 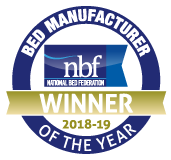 And what better place to do that than in a luxury handmade bed from our exclusive Quilted Collection from Millbrook Beds. A luxurious collection featuring five specifications from our 1000 pocket spring model up to a 3000 pocket spring model and combining the ultimate in luxurious natural fabrics and fillings such as layers of Hampshire Wool, silk and soft cotton, the Quilted Collection will see you sleeping comfortably all year round. The Quilted Collection features a Non Turn Easy Care Mattress that is finished to our high standards with two rows of traditional hand side stitching, layered with temperature regulating cotton and a sumptuous Tencel knitted quilted top. Launched at the Bed Show last year, the Quilted Collection is one of our newest collections and one of our first to feature Tencel knit which – owing to its biodegradable properties and softness – is fast becoming the one of the most in-demand textiles. So what’s stopping you? Pull up the quilt and get comfortable in a luxury handmade bed from the Quilted Collection at Millbrook Beds.